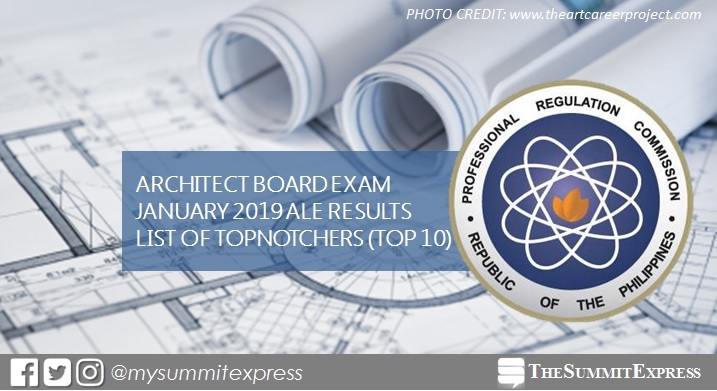 MANILA, Philippines – The full list of topnotchers or top 10 passers in the January 2019 Architecture board exam is available on this page as officially released on Wednesday, January 30 or in three (3) working days after the exam. Justin Lei Germino Ramos of Cebu Institute of Technology (CIT) - University topped the board with 83.80%. It was followed by Carlo Martin Lovete Llanto of University of the Philippines (UP) - Diliman and Christina Marie Reamico Relucio of Technological University of the Philippines (TUP) - Manila, both garnered 83.50% grade. In the same period last year (January 2018), Marc Henrich Wee Eng Go of University of Santo Tomas (UST) aced the board with 85.40%. It was followed by Marc Terence Limsico Co and Rafael Cruz Paragas, both from the University of the Philippines (UP) - Diliman, with identical grade of 84.20%. In the January 2017 exams, Luiz Marko Pantua Silang of UPD topped the board with 83.70%. Robin Royce Yu Ibanez, also from UPD, ranked second with 83.20%. Monitor this page for the real-time updates on Architect board exam results. Check out also the official website of PRC for more information.